Akerson on GM reaching investment grade: "There are things that will happen over the next year or so that will drive that decision." NEW YORK (Bloomberg) -- General Motors Co. CEO Dan Akerson said he hopes the automaker regains an investment-grade credit rating within the next year. "There are things that will happen over the next year or so that will drive that decision," Akerson said in an interview this week at Bloomberg’s New York headquarters. "I hope so, but I don’t know," he replied when asked if GM will get an investment rating in 12 months. 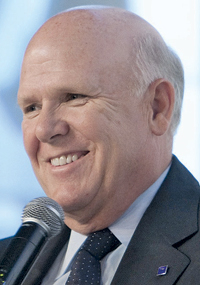 Akerson, 63, who became CEO in September 2010 less than three months before GM’s initial public offering, has pushed for additional restructuring as he tries to increase GM’s profit margins, which lag behind Ford Motor Co., Volkswagen AG and Hyundai Motor Co. The automaker, along with Ford, fell to junk status in 2005 as part of a slide that eventually included GM’s government-backed bankruptcy reorganization in 2009. Ford avoided bankruptcy, recorded a $20.2 billion profit last year and was returned to investment grade by Fitch Ratings in April. Ford’s net income included a $12.4 billion non-cash gain related to tax accounting. GM, which earned a record profit in 2011 of $9.19 billion, will likely follow Ford to investment grade by one or more of the major credit-rating companies this year, Vince Foley, an industry analyst with Barclays Capital, said in a telephone interview. Akerson said a return to investment grade would be “symbolic,” calling it one measure of success.